Help us co-design nature play spaces in Woden, the City, and Farrer. The Better Suburbs Statement was tabled in the Assembly on Tuesday 18 September 2018 by the Minister for City Services, Chris Steel, after being developed through a new model of engaging with the community – through deliberative democracy. The Statement reflects the value the community places on the different city services provided by the government and identifies the efficiencies that could be drawn from this. Phase 3 – a Citizens’ Forum of randomly selected participants from the community who worked together to develop the content for the Better Suburbs Statement. The Better Suburbs Program continues with shared decision making about play space funding allocations being undertaken with a smaller community forum, which includes members of the Citizen’s Forum. 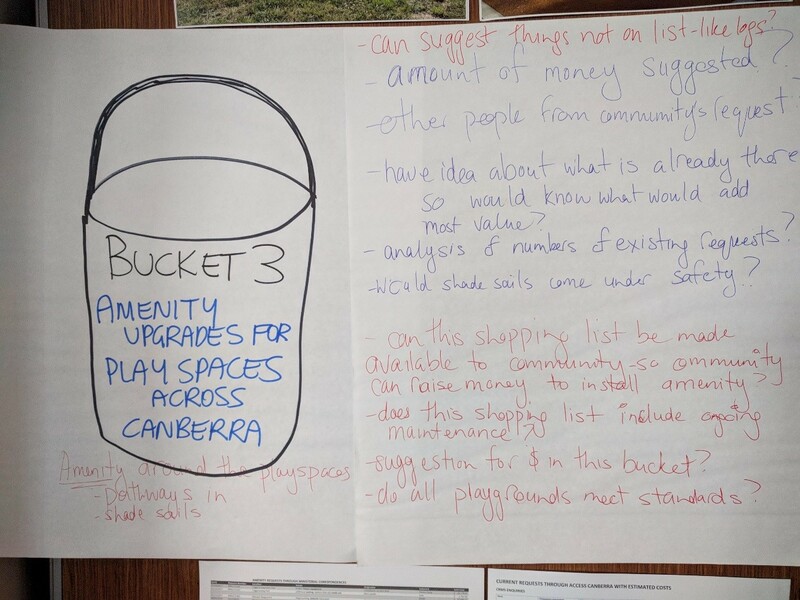 At the first Citizen’s Forum, a participatory budgeting activity commenced to identify the allocation of 2018-19 Better Infrastructure Funding for play space infrastructure improvements in Canberra. This work continues in the upcoming weeks to finalise allocations. By 2030, we're heading towards Canberra being home to 500,000 people. Our suburbs will look and feel different and our city services will need to respond to changing expectations. How we use our land for housing and other purposes, move around our city, care for our environment and have services and space that allow us (and our animals) to be social will be different. Decisions about our city services need to be made now for the future. They will have to balance community needs with being financially sustainable. This Better Suburbs Statement gives us a shared vision for city servicing in 2030, along with short term priorities that will lead us to this goal. Your feedback from Phase 1 and 2 consultation were used to present discussion topics in Phase 3, the Citizens' Forum. The survey findings, Kitchen Discussion Guide feedback and Citizens' Forum discussions have contributed to the development of the Better Suburbs Statement. The Better Suburbs Statement was drafted and presented by a Citizen’s Forum to the then Minister for Transport and City Services, Meegan Fitzharris, MLA on the last day of Forum proceedings. The Statement is now publicly released. • made recommendations on how the ACT Government should work with the community in making decisions about play spaces into the future. The final (fifth) day of the Better Suburbs Forum was set aside for Day 1 of Play Spaces Forum on 19 August 2018. 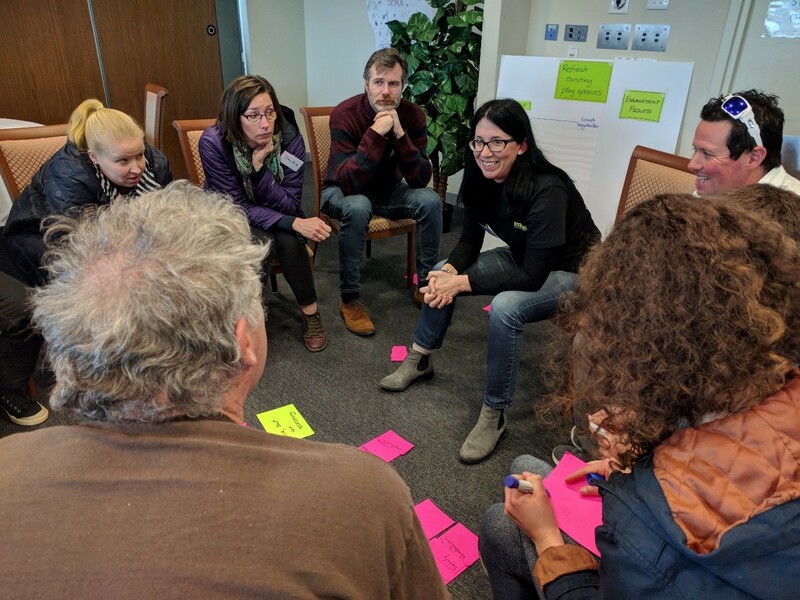 There were 45 participants, including Better Suburbs forum members and nine additional forum members with a personal perspective on play spaces. This day was facilitated by democracyCo. A second Play Spaces Forum day (Day 2) was held on 22 September 2018 with 21 participants. A Priorities Framework was agreed and the allocation of $1.9 million into categories was finalised. This day was facilitated by Jacinta Cubis (www.jacintacubis.com). Four smaller panel meetings were then held in September and October 2018, each with up to 10 forum members. These panels made specific location and project decisions to spend the money that had been allocated into categories. The panel meetings were held on 26 and 27 September and 16 and 23 October 2018. Forum Members received an Information Pack as background reading. 16 submissions were received from stakeholder organisations. These are available in the Document Library below. Day 1 of the Play Spaces Forum was about knowledge building. Participants analysed and deliberated on the 16 community submissions. Presenters on the day included: four community petitioners (available in the Document Library below); play space expert Greg Mews; and from TCCS management, Stephen Alegria and Owen Earl. A Community Report from Day 1 was developed by facilitators, democracy Co.
A Community Report from Day 2 was developed by facilitator, Jacinta Cubis. A Decision Summary was developed by the Better Suburbs team. The Forum agreed on a Priorities Framework to guide play space decisions. These include prioritising play spaces near shops and other facilities, planning for equity across the city, setting targets for accessible and inclusive play and continuing to work in partnership with the community, especially children and young people. The Forum allocated $350,000 to create new nature play spaces to enhance Eddison Park in Woden and Glebe Park in Civic, which will be designed in partnership with the community. These aim to add play value and enhance the experience for visitors to these parks. Natural play spaces provide creative and imaginative play experiences, using elements from the landscape, such as logs and rocks, to encourage children to climb, jump and explore. The Forum also allocated $375,000 for five whole of suburb play reviews in Richardson, Warramanga, Torrens, Narrabundah and Higgins. A co-design process with residents from each of these suburbs will determine the best mix of play spaces to meet the needs of a diverse range of community members. Each suburb will receive detailed plans for one new (or re-built) play space and concept plans for the whole suburb. This is a new way of planning for play, looking holistically at a suburb rather than at one playground at a time. $525,000 was allocated to amenity upgrades in 35 play spaces across Canberra, including shade, seating, landscaping, furniture and paths. These upgrades will improve the experience for a range of visitors, including children of all ages, adults, older Canberrans and those with disabilities. The Forum allocated $500,000 to deliver essential work to protect the condition of 16 play spaces that are structurally sound but in need of refreshing. This work will extend the life of these play spaces by five to six years, and improve the aesthetics. Works will include repainting the equipment, replacing soft-fall mulch, replacing borders and repairing seating, decks and fences. 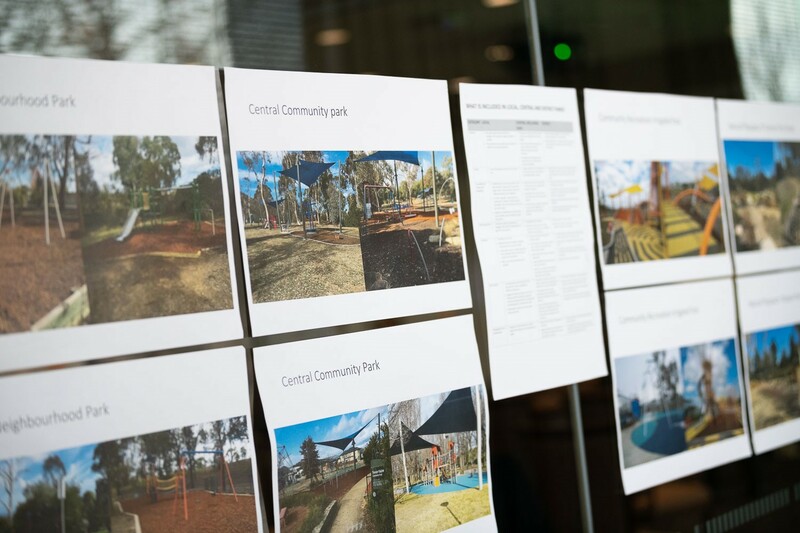 The Forum allocated $150,000 for the creation of a strategic plan for Canberra play spaces. It was determined post forum this will be most effectively delivered in the 2019-20 financial year to enable all of the insights from the delivery of play space work in 2018-19 to be captured in the strategic plan. (This released the $150,000 for 2018-19 to the construction of an additional nature play space in Farrer). For more information on the the Priorities Framework, the budgeting decisions and details of play spaces to receive new amenity or refresh work, see the Decison Summary report. As part of the ACT Government’s Better Suburbs Program, a community-led Play Spaces Forum allocated $1.9 million to play spaces in 2018-19. This Forum trialled a new way of making decisions in the ACT, through participatory budgeting. The Forum’s decisions are now being implemented by the ACT Government. One key decision was the allocation of $350,000 for new nature play spaces to enhance Eddison Park in Woden and Glebe Park in the City. $150,000 has also been set aside to build a nature play space in Farrer. The forum specified these nature play spaces are to be designed in partnership with the community. In late 2018 and early 2019 targeted engagement and co-design with local schools, child care centres and youth centres was undertaken, as well as broader community engagement. Natural play spaces provide creative and imaginative play experiences, using elements from the landscape to encourage children to climb, jump and explore. These new play areas add to Canberra’s extensive playground network, providing opportunities for social interaction and play to enrich the lives of our children. Nature play spaces can include anything from bike trails, dry creek beds, balance beams, climbing structures, cubby houses, water and sand play, sensory landscaping, balance logs, and much more. We asked the community what sort of play elements they want to see in the natural play spaces at Glebe Park, Eddison Park and Farrer. Your views will help to inform the design of the natural play spaces in Glebe Park, Eddison Park and Farrer. Review of Phase 1 consultation feedback to develop consultation report. Using Phase 1 consultation results to prepare the Kitchen Table Discussion Guide. A Forum where randomly selected participants will work together to develop a vision and an agreed set of priorities for future city servicing. A second Play Spaces Forum meeting was held. A Priorities Framework was agreed and the allocation of $1.9 million into categories was finalised. Four smaller panel meetings were then held to make specific location and project decisions to spend the money that had been allocated into categories. Engagement commences with local schools, community groups and the broader community on the design of natural play spaces in Glebe Park, Eddison Park and Farrer. When: 10 am to 1 pm, during the Merry and Bright family festival. Near Akuna Street side of the park. When: 5.30 pm to 7 pm (to have your say about nature play at Farrer) at 4 Farrer Place, Farrer. When: 8 am 10 am (to have your say about nature play at Eddison Park) at Canberra College, corner of Launceston St and Yamba Drive, Phillip. Register to receive updates about the Better Suburbs Statement. The online ‘YourSay’ service is provided using a digital platform operated by Harvest Digital Planning (Harvest) on behalf of the Chief Minister, Treasury and Economic Development Directorate (CMTEDD). The ACT Government respects the rights and privacy of all individuals and is committed to complying with the Information Privacy Act 2014 and the Territory Privacy Principles and protecting the personal information we hold. Why does the ACT Government collect personal information, and how is it used? CMTEDD (via Harvest which is contracted service provider of CMTEDD) collects your personal information as part of providing the Territory’s online community engagement services, informing you about these services, complying with contractual and other legal obligations, responding to your enquiries and administering its community engagement technology. CMTEDD may use your personal information for these purposes, any other purpose listed on a collection statement at the point of collection, or in any other way made clear at the time of collecting the personal information. In cases where feedback is received about an engagement opportunity that is subject to another Territory agency's Terms and Conditions, or arrangements for handling personal information, your feedback may be provided to the agency concerned. In your feedback to the ACT Government, you should not provide personal information, including personal health information (for example, any information (medical or otherwise) about a person’s health, mental status, treatments received etc) about any other person (a third person). This information is analysed and interpreted by CMTEDD staff, staff of other ACT Government agencies and in some circumstances, third party contractors who have been engaged to assist in the analysis of the data collected, to inform the creation of better projects, plans and policies. Yes. You can access and participate in select ‘YourSay’ engagements anonymously, without disclosing any personal information. Some identified studies may require you to register and establish an account in order to participate. Users may choose to adopt a pseudonym for these studies. Demographic details are requested in order to help us determine the degree to which views of participants are representative of a diverse cross-section of the community. By providing an email address you help us protect the integrity of the discussion from individuals and groups who may attempt to unduly influence the outcomes of the consultation process anonymously. For example, we check the database to ensure each user has a single email account on the site. We also frequently review the site for trolls and spammers. If you are registered and signed-in to your user account, the contributions and feedback you provide may be linked with your username and any demographic details you have recorded in your account. If you subscribe to receive notifications about upcoming consultations, the email address you provide will be used by CMTEDD to send you information and updates about new opportunities to have your say. You can unsubscribe from these updates at any time. To the extent that this data could make you identifiable, CMTEDD and Harvest will not attempt to identify individuals from the records the server automatically generates unless necessary to investigate a breach of law or regulation. Who has access to information that is collected from you? information that is available to CMTEDD and Harvest in its capacity as CMTEDD’s contracted service provider (and its agents and sub-contractors who may be based overseas, namely, in the Philippines) and which may be made available by CMTEDD to other entities as set out in this privacy notice. Publicly available information is limited to your username and any comments you leave under that username in the forums or other feedback tools published to ‘YourSay’. Please note that the ACT Government is subject to the Freedom of Information Act 2016. The Freedom of Information Act 2016 provides a general right of access to government information. This includes documents created by the government, documents held by contracted service providers relating to the performance of government contracts and documents supplied to government by external organisations or individuals. de-identified data for reporting purposes. CMTEDD will take all reasonable measures to prevent unauthorised access to, or disclosure of, your personal information. Organisations to which personal information is disclosed include other ACT Government directorates, the ACT Government’s contracted Service Providers, such as Harvest and their subcontractors or agents who may be based in Australia or overseas (namely in the Philippines), who perform various services for and on behalf of the ACT Government. These contractors have agreed to be bound by the provisions of the Information Privacy Act 2014. We will also take all necessary measures to ensure that your personal information is not disclosed to other individuals, institutions and authorities except in accordance with the Information Privacy Act 2014, such as if required or authorised by law or explicitly permitted by you. Some examples of when information may be provided to another person without your consent include in the event of an investigation into suspected unlawful or improper activity or when a law enforcement agency or government agency may exercise its legal authority to inspect the web server's records (e.g. in relation to hacking or abusive messages). You may seek corrections to your personal information that CMTEDD has collected if you believe it is inaccurate, out-of–date, incomplete, irrelevant or misleading. CMTEDD is required to take reasonable steps to correct personal information to ensure that, having regard to the purpose for which it is held, the information is not inaccurate, out-of–date, incomplete, irrelevant or misleading. You may also seek access to your personal information that CMTEDD holds. The ‘YourSay’ Privacy Statement does not apply to third party websites or digital services which may be linked to from content published to 'YourSay'. We recommend you read the privacy statement of the relevant service when you access these sites. We sometimes use third party providers for some web-based services, with information stored in the United States and Europe. These include Campaign Monitor and Mail Chimp for email subscriptions, Survey Monkey and Typeform for online surveys, Social Pinpoint for interactive maps, Viostream for live streaming question and answers, MindHive for running a collaborative forum and EventBrite for registration at events. Please follow the hyperlinks for details on their privacy policies. CMTEDD uses Campaign Monitor to provide electronic newsletters to subscribers. clicks on email links and whether the email is forwarded. CMTEDD holds the Campaign Monitor account and personal information collected through that account can be accessed by other agencies of the ACT Government for the purposes of sending electronic newsletters. Campaign Monitor will use the information collected from you for the purpose of providing the online service which enables CMTEDD and other agencies of the ACT Government to create, send and manage electronic newsletters. Campaign Monitor will also use this information to measure the performance of CMTEDD and other ACT Government email campaigns. Campaign Monitor may transfer this information to its contractors or other third parties who process the information on Campaign Monitor’s behalf, or where otherwise required to do so by law. Campaign Monitor is based in the United States of America (USA) and is subject to the laws of the USA. Your information (including your IP address) will be transmitted to and stored by Campaign Monitor on servers located outside Australia. You can unsubscribe from the 'YourSay' electronic newsletter at any time by selecting the 'unsubscribe’ option in every email sent to you by Campaign Monitor. More information about how CMTEDD manages the personal information it collects can be found at http://www.cmd.act.gov.au/legal/privacy. Who should I contact if I have any concerns about how my personal information is being managed? but does not include personal health information about the individual. (b) collected by a health service provider in relation to the health, an illness or a disability of the consumer. These Terms shall be governed in accordance with the laws of the Australian Capital Territory. What content does the ACT Government own? Your Say website contains the copyrighted material, trademarks, patents, trade secrets and other proprietary information (“Intellectual Property”) of Harvest and its suppliers and licensors. ACT Government owns and retains all proprietary rights in the intellectual property. All intellectual property in the content of this site including without limitation to text, software, source code, pages, documents and online graphics, photographs, sounds, audio, video and other interactive features are owned by or licensed to us. Except for Intellectual Property which is in the public domain or for which you have been given written permission, you may not copy, alter, transmit, sell, or distribute any of the Intellectual Property. Users must agree that your use of the site is at your own risk. We make no warranty that the site will meet your requirements or be uninterrupted or error-free. Any material that the user downloads through the site is done at their own risk and users are responsible for any damages to their computer system or loss of data.